Invitation flags - Print out party information on black/white checkered scrapbook paper 4 x 6" (off set the information 1" to the right). Glue left edge of the paper to a 10" straw or wooden dowel. Make tracks invitation - on plain note cards with a matte finish (not shiny) make track marks across the front by dipping the wheels of a toy car into black acrylic paint and rolling it over the front of the invitation. Decorating for a Nascar party can be done in many different ways. Use the Nascar logo colors of black, white, yellow, red, purple and blue. Use black and white with touches of your favorite driver's colors. Decorate the party in your favorite driver's colors with their number clearly displayed. Tie black and white helium balloons to the mailbox. Line the driveway and walkway to the front door with black and white checkered flags. You can buy them on line, or make they yourself from checkered scrapbook paper, wrapping paper, or fabric. Hang a banner over the front door that says "Let the race begin!" or "Gentlemen start your engines!" For the party table - decorate using a white tablecloth and black cups, plates (wheels) and napkins. Add a touch of red or yellow with the flatware. Black and white checkered bandanas as placemats (these can double for a party favor). Make black tire tracks over a white table cloth (use cloth or paper table cloths - plastic doesn't work well) by dipping a tire (motorcycle, lawnmower or any wheel with tread) into black acrylic paint. Lay the table cloth flat and roll the tire over the cloth several times in different directions. Let dry and place on table. Black and white helium balloons on the table are a great touch - tie them to small wheels (wagon or lawnmower wheels) and place around the party table. Make an oval track around the party table with black electrical or duct tape. Set small race cars at each place so kids can play with them while they eat. Tire print shirts - Buy a shirt for each guest at the party - buy them in different colors, your favorite driver's colors or black. Lay the shirts flat and insert a large piece of cardboard into the shirt so that the shirt isn't stretched, but isn't loose either. Fill a large rectangular container with black fabric paint (acrylic paint won't work unless you add a fabric medium to it) - the container needs to be large enough so the wheel can be put inside it to get paint on the tire. Don't fill the container very high with paint 1/4" or so is fine. Using a wheel from a motorcycle (or any tire with tread) place the tire in the container and cover the tread with paint. You can also use a paint brush to paint the tire tread. Then let the kids roll the tire over the shirt in different directions. We like the reverse look of a black shirt with white tire tread prints too. A variation is to use small toy cars across the shirts. Let the shirts dry (you may have to iron them to heat set the design before the guests go home - check the instructions on the fabric paint) and then give them to the guests as party favors. Recycle racecars - On a large table set out empty containers, paper towel tubes, pipe cleaners, lids (for tires), brads, paperclips, rubber bands, construction paper and glue. Let party guests build their own race cars. You may want to make up a few samples before the party to give the children some ideas. Foam license plates or picture frames - Let children decorate a large rectangular piece of craft foam or a picture frame like a license plate with large foam letters and paints. Racing car on a wooden spoon - One by one team members hold a wooden spoon with a hot wheels car on it (like the egg and spoon race). Once around the track and then the next person in their team goes. First team done wins. If the car is dropped the person must return to the line and begin again. Hula hoop race - One by one team members have to roll a hula hoop around the track. Holding a black balloon or tire between their legs as they run. Clean sweep - using a broom to sweep 3 balloons or ping pong balls around the track. Balancing a plastic tire or steering wheel cover on their heads. Tire relay - have children roll a motorcycle or small tire around the course. These games can also be played individually by timing the children with a stopwatch. 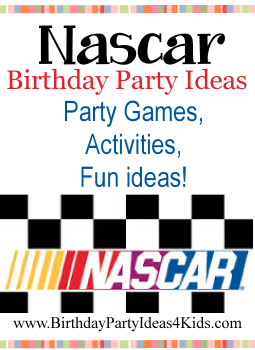 Traditional games with a Nascar twist such as Pin the Wheel on the Car (played like pin the tail on the donkey), Race car walk (played like a cakewalk using black round tires made from construction paper to make the cakewalk circle) or Red Flag - Green Flag (played like red light - green light) are also fun at a Nascar birthday party.